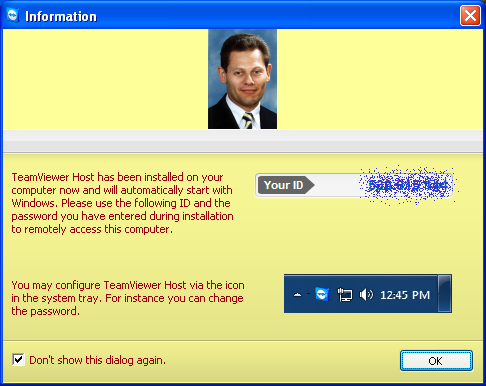 Sometimes you have an error message or popup window that can be more easily understood by showing a technician. For help with a single message, just copy it into an e-mail message and send it to 1ComputerCare. 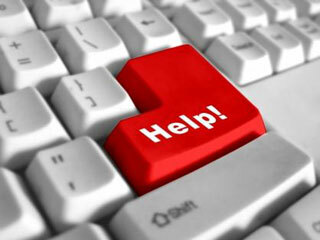 For immediate support please click here. For problems that are not easily e-mailed, there is a facility that allows clients to have small problems resolved or quick questions answered remotely, and hence much faster than would otherwise be the case, and there is often no charge. This involves running a simple program to allow the technician to see your screen display from afar. This way we can often explain what is happening and how to resolve it without the need for a visit. 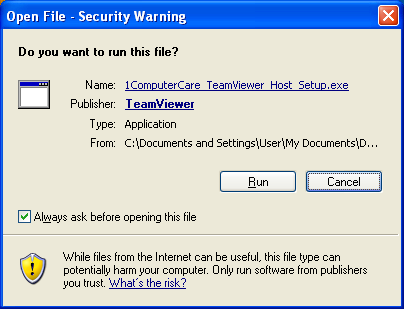 Even when 1ComputerCare staff are moving the mouse pointer and running programs from a distance, the client retains control and can see what is happening on the screen. 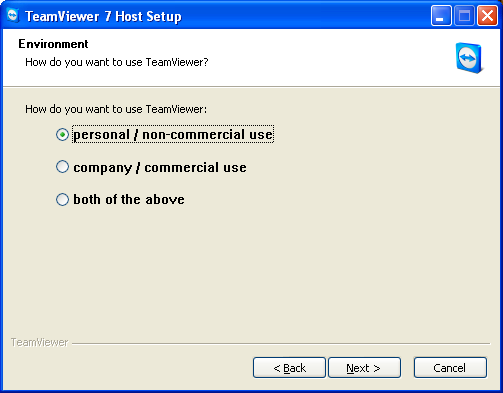 Security is assured as the connection can only be initiated from the client end and all data is encrypted. This facility is best set up and tested before you need it in an emergency. 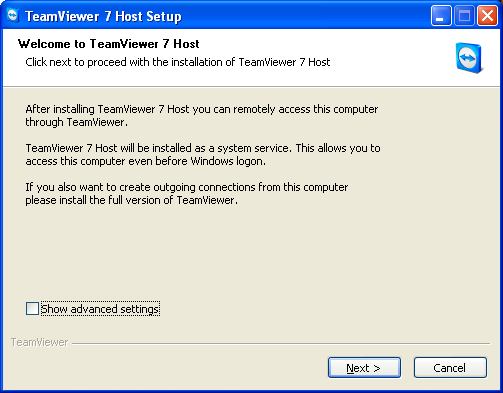 Whilst Windows inbuilt Remote Assistance, pcAnywhere, CrossLoop and web based tools such as GoToMyPC and LogMeIn are supported, the preferred choice of client program for ease of use and reliability is TeamViewer. 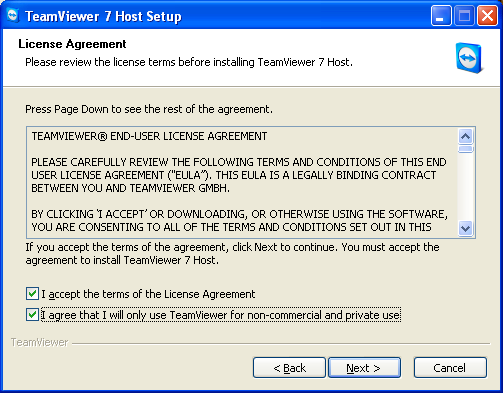 For most people, administrative rights are theirs and a proper installation that does not need to be repeated when a second connection is required can be achieved by clicking the button to the right. You will be taken through the following dialog boxes. Once I know your password I should be able to connect. This is only done after verbal invitation as described on my Passwords and Privacy page. If the above process did not work for you i.e. you did not get to the 'Finish' button and see my face as in the above image, it may be that you do not have an administratively privileged account on the computer. 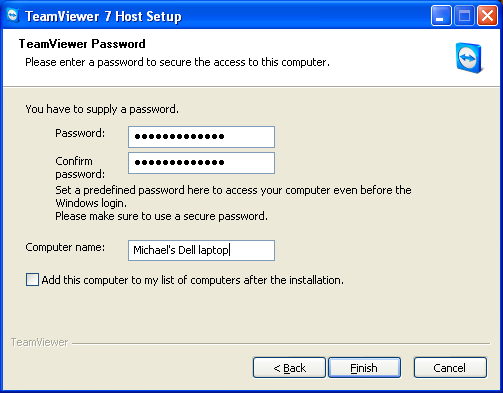 To set up the capability when you do not have administrative rights on your PC just click the button to the right then run the downloaded program every time you want a connection.